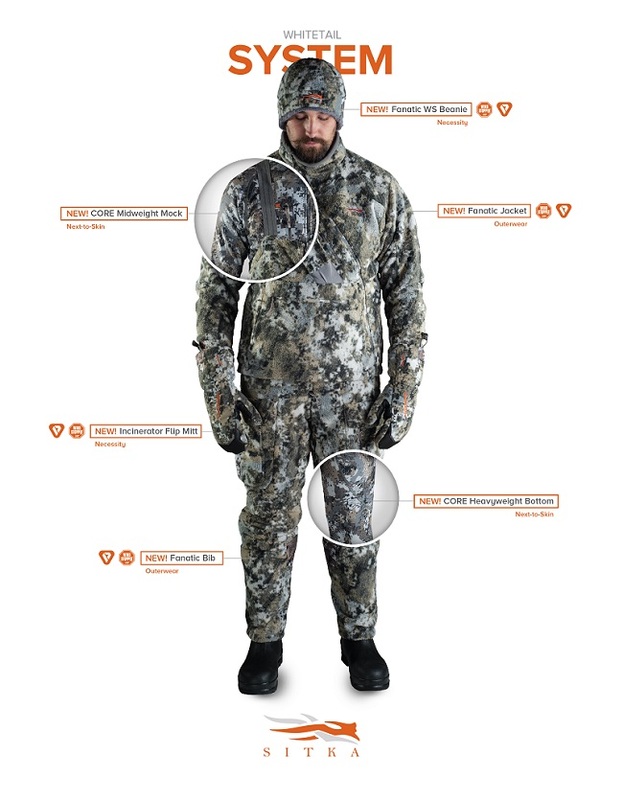 SITKA GEAR: The new Fanatic Lite Jacket is an answer for those cooler mornings that warm quickly as the sun rises. The durable high gauge face fabric is bonded to an air-permeable honeycomb jacquard Micro-Fleece to allow breathability and remarkable noise reduction. A front storage pocket, rangefinder pocket with tie-off and safety harness pass-through port keep you and your necessities in place. The Fanatic Lite Jacket is available in the new GORETM OPTIFADETM Elevated II pattern, is available in medium to 3XL sizes and has an MSRP of $289. Also new is the Fanatic Hoody, here Sitka took the chassis of a traditional hooded sweatshirt and used a body mapped grid and micro grid fleeces, to regulate your temperature while keeping scent to a minimum with Polygiene® Odor Control Technology. The hood is cut for maximal peripheral vision, and from within it you can deploy the built-in facemask for enhanced concealment. The half-zip construction allows for a built in hand muff, which, together with the flip-over hand mitts in the sleeves, works to keep your fingers warm and dexterous. The Fanatic Hoody is available in the new GORETM OPTIFADETM Elevated II pattern, is available in medium to 3XL sizes and has an MSRP of $189. During the peak of the rut, the longer you can be alert in the stand your chances of having a successful sit will increase; this is when the Fanatic Jacket and Bib shine. A Berber fleece face silences the GORE® WINDSTOPPER® barrier, while body-mapped Primaloft® Silver Insulation traps body heat where you need it. At the heart of the Fanatic Jacket is the diagonal-zip, which while sealing out the wind, allows for a zippered front muff to keep your digits toasty and agile, waiting to take that next shot. A magnetic closure rangefinder pocket, safety harness pass-through port, and internal gasketed cuffs round out this feature filled jacket. The Fanatic Bib allows for rubber boots to fit comfortably over the low-bulk hems, where a dedicated ankle pocket lets you rest your traditional bow hands-free. Both the Fanatic Jacket and Bib are available in the new GORETM OPTIFADETM Elevated II pattern, and are available in small to 3XL sizes, along with medium to XL tall sizes in the Fanatic Bib. The MSRP's for these items are $399 for the Jacket and $389 for the Bib. Rounding out the Fanatic System are the Fanatic Gloves, built from 4-way stretch-woven polyester; these gloves offer the balance of warmth and dexterity. The half-finger design on the forefinger and thumb free up your primary finger for release triggers and touchscreens. The Fanatic Gloves are available in the new GORETM OPTIFADETM Elevated II pattern, available in medium to XL sizes and have an MSRP of $40. Prime Archery, a leading manufacturer of the most technologically advanced and highest-quality bows available, is excited to welcome professional archer, Martin Damsbo, to their competitive archery team as the newest Prime Pro!